and some pyjamas are budget pyjamas with a definite orange hue. Some pyjamas have a rope or a cord which are made for classier folk. Some pyjamas are budget pyjamas, a good bet for lads who are broke. but some pyjamas are just right for a nap while on TV. It just popped into my head, almost complete, just as I was going to sleep... I had to damn well get up and write it down! "What a fine poem. A worthy winner. I've always imagined Ken in a nightshirt holding a flickering candle, BQ. You know he must be having too many fine dinners with benchers." It was a shame that the camera cut back to Osborne. If it has lingered a little longer you'd have seen my hand hand slip inside his jacket pocket and remove a 1/2 bottle of House of Commons Whisky. Keeping it 'safe' for him. You're right Measured. He does look like he wears night attire from the M+S Christmas Carol collection. 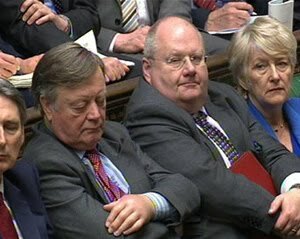 Leave the old lad alone, after all Ronald Reagan fell asleep in important meetings, also Ken Boy was sat next to Fatty Pickles but how he fell asleep next to a man who takes 2 seats I don't know he seems quite comfortable though (Ken). This is the first time I visited this blog. Really this is awesome work with the blog. Hello there, I discovered your website by way of Google whilst looking for a similar topic, your site came up, it appears great. I’ve bookmarked it in my google bookmarks.